Cantilever Parasols are usually more sensitive to wind than a centre pole parasol. This is obvious from the design as well as the balancing of the weight of cantilever parasol canopy itself and the base weight is much more difficult. I always tell my customers that buying a cheap Cantilever Parasol is really not so much a good idea, particularly if you live in a windier location. Some badly designed and engineered cantilevers parasols will simply fall over far too frequently for them to be a real shade solution. The cantilever parasols that we have chosen are the Serengeti Eclipse and Serengeti Equinox and they are well based and engineered. They are not really the cheapest but for the quality but I think they have a very good and reasonable price. It remains the case, even with a good quality cantilever parasol that you will require to manage it for the wind. The cantilevers we buy should not have their canopies open in more than a medium wind. The last thing you want is for one to topple over or either of them to cause damage or to damage. So, remember to close the canopy before you go out as well as at during night. The best way to increase wind resistance and reduce the risk of the parasol falling over, is basically, to use an in ground base. This is a tube set in concrete in the ground and the parasol pole can then be slid into the tube. This has the advantage of giving greater wind resistance, but of course, it does reduce the mobility of the base. In winter, we just have to remove the parasol and there should be a flap to cover the hole in the ground. Cantilever parasols have many advantages, such as or for example, the lack of centre pole makes the shade they offer very more versatile, but they do need to be sited correctly. 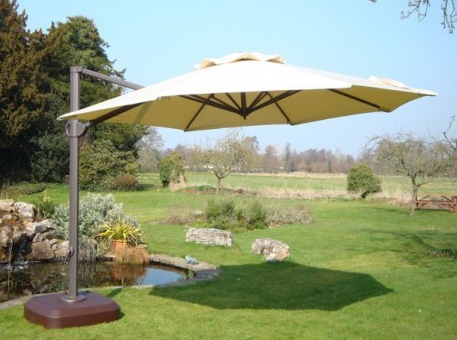 When buying your cantilever parasol for your garden or patio or deck, you should think about where it will be located. The positioning of the cantilever parasol is really important and is by having a cantilever parasol you can position it almost anywhere. Now, another factor to the base could be the size and dimension of the Cantilever Parasol itself. Much like an umbrella, the cantilever parasol could cover many things from both the sun and the rain. By determining how large you need your parasol to be could help what type of base you need. Now in most cases cantilever parasols are used to shade oneself from the sun. The best way to determine the size of the parasol is to measure the area and perimeter of the ideal coverage and all patio chairs and the table for example. The essential rule when calculating the diameter of the covered area is that the cantilever parasol should be at least five feet bigger than the supposed area. The farther away the parasol the more coverage you get from the sun.